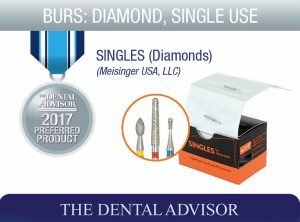 MEISINGER “Singles” are synthetic diamond-coated burs designed for single-patient use. They are pre-sterilized and sterile packaged. The burs are color-coded by grit for quick categorizing and selection. “Singles” are sold in boxes of 25 individually packaged, sterile burs and are available in 180 shapes in Super-Coarse, Coarse, Medium, Fine, and Extra-Fine grits. 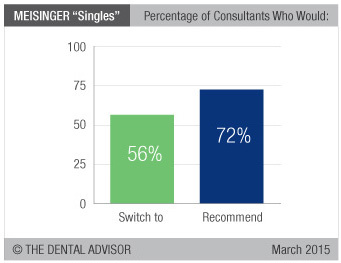 “Singles” were evaluated by 25 consultants in 492 uses. These diamond burs received an 88% clinical rating. “Singles” diamonds have a uniform grit and very good cutting efficiency. The pre-sterilization allows them to be used right out of the package, saving time and increasing efficiency. 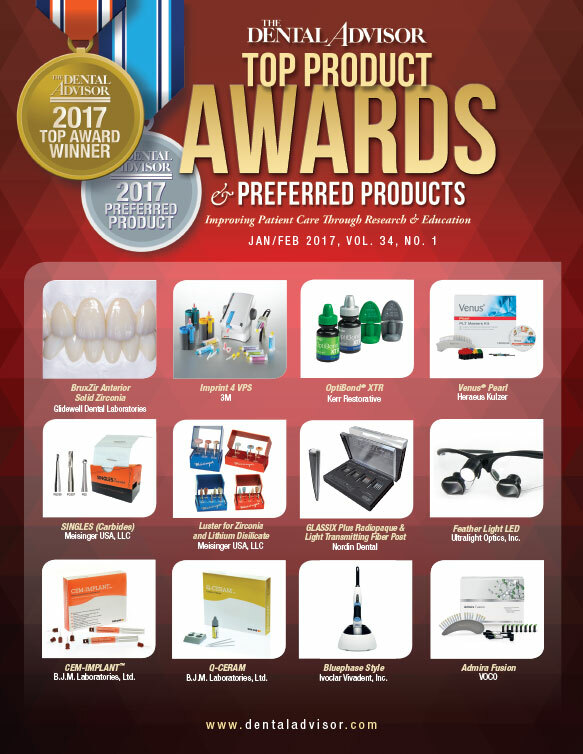 Consultants evaluated a variety of shapes, and they proved to be durable for single-patient use. The fine grit finishes restorations well and performs as well as some multi-use diamonds. The packaging is easy to open chairside. 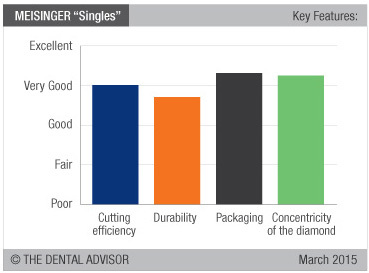 A test comparing the durability of the MEISINGER “Singles”, NeoDiamond and Premier Solo type 856 diamond burs where all were driven by a Kavo Gentle Silence handpiece to cut a 2 mm deep groove in a plate glass specimen was performed. Pulsatile loading and unloading at a rate of 1 cycle per 3 seconds was used. Volumetric cutting rate versus the number of cycles was determined and is reported in the graph below. Conclusion The MEISINGER “Singles” did not wear as much over the 275-cycle test as the other two burs tested.